Siberians who heed their ancestors' call tell about their "career path"
Due to their beliefs, the heroes of this story cannot be photographed. Pictured here are other Siberian shamans. I am personally acquainted with a few Khakassian shamans who live in Abakan, the capital of Khakassia. A shaman is an intermediary between the world of men and the world of spirits. Khakassians believe that every living thing has a soul. In their worldview, mountains, rivers, steppes and the sky participate in a person's life alongside gods and the spirits of ancestors. The gift of shamanism is inherited: According to local legends, the ancestors choose one of their descendants and instruct him or her. Those who dare to disobey will be severely punished with illness, bad luck and a painful death. The spirits tolerate no defiance. Akh Aba (Polar Bear in Khakas) started performing shamanic rites 12 years ago. At the age of ten, she fell gravely ill – her entire lower body was paralyzed. The doctors were unable to determine the cause of her illness, but predicted that she would die soon. The girl was cured by an elderly witch doctor, who believed that the child had begun to suffer from the "shaman disease." "I suspect that at that moment my fate was decided," Akh Aba laughs, telling us her story. Akh Aba spent 30 years trying to escape her true vocation. But in her dreams, her ancestors often came to her and demanded that she take the path which had been chosen for her, and when she refused, they tortured her body. Any work she performed caused her sickness or other troubles, and the ancestors' spirits who haunted her explained that it was going to continue until she decided to become a shaman. Today Akh Aba helps people: She heals the sick, tells the future, and guides the souls of the dead to the next world. 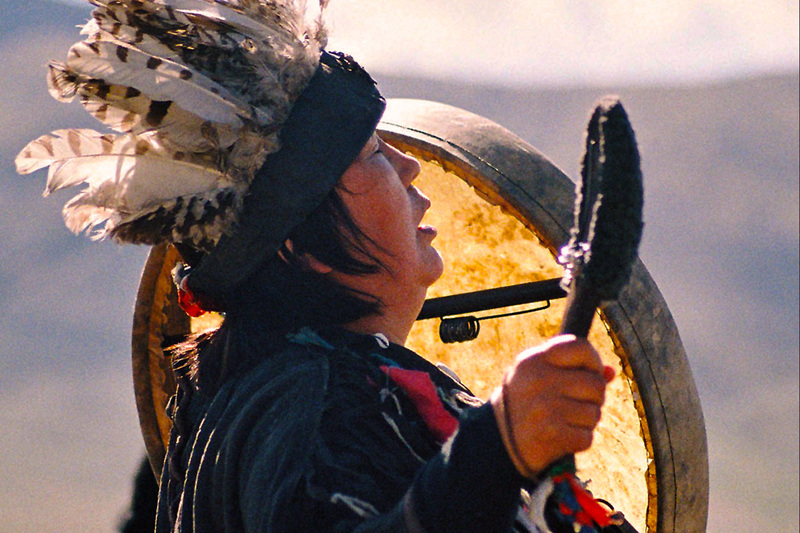 Each shaman has his or her own "specialty" – the rituals he or she is the most skilled at performing. During her rituals, Akh Aba makes a pact with Death so that Death will not take the person who seemed fated to die. The rituals she performs are considered to be among the most dangerous and difficult because Death sometimes demands not only the flesh and blood of freshly-slaughtered animals, but also years of the shaman's life. Shaman Bek died for the first time in 2012. His heart almost stopped and he entered a very deep trance. While his body remained in the Middle World, his soul traveled, communicated with ancestors and patron spirits, received instruction and studied the structure of the Universe. It was then that Bek learned that he would frequently make such journeys and thus help other people. Since that incident, Bek has acquired the skill of "traveling to the world of the dead," which is believed to be extremely dangerous, as the shaman may fail to return from the underworld. On average, he "dies" a few dozen times a year. Sometimes Bek is possessed by the spirit called Khuu Pas, "the soul eater." This malicious and cruel spirit helps the shaman but takes a heavy toll. However, when Bek is asked for help in the event of a grave illness, he cannot cure the patient without the soul eater. According to shamans, spirits cannot be seen as good or evil. Every creature can do harm or do good; the most important thing is to reach an agreement with it. Normally, spirits are appeased with sacrifices: Milk, vodka, sweets and the meat of animals slaughtered during specific rituals.Moral values among shamans also vary: They can cure, but they can curse as well, depending on what they wish to do. The only thing they are not allowed to do is to refuse to help people. Shamans who do so are punished by their own spirits, who take away their health, powers and sanity. Altyn Ay (Golden Moon in Khakas) has followed in the footsteps of her grand-uncle. He was a great shaman, and a few years after his death, he appeared to his grand-niece. At his command, she took the first steps along her own shaman’s path: In her dreams and in her waking life, Altyn Ay started seeing the world of spirits. In Khakassia, she became Bek's disciple, but then went on to learn from Akh Aba. At present, she is traveling to sacred places and tribal shrines, but when the snow melts, she will take up the shaman’s drum. Altyn Ay says she is afraid of her destiny, as a person becomes a shaman for all time; even death brings no deliverance. In the afterlife, a shaman's spirit will make its permanent home in the clan's altar, and will offer guidance and help to his or her descendants. Most shamans are lonely. Spirits often prevent them from starting a family or doing anything apart from their sacred practices. Shamans are frequently at war with each other because their spirits are at odds, and the shamans try to find out who is the strongest. Such conflicts prevent long-term relationships and close friendship.Ordinary people fail to understand shamans for the most part: They live on the border between two worlds and have their own vision of both. None of the shamans who shared their stories with us wanted this for their destiny. They were ordinary people, resistant to change, but eventually they accepted their true vocation. Shamans are sincere about their beliefs, and a lot of people need their help: Hundreds gather to witness their rituals in Khakassia. For instance, Chyl Pazyl, the Khakassian New Year which is celebrated at the end of March, brings together almost the entire indigenous population of the republic. Ancient beliefs exist in modern Russia, either adapting to modern reality or disregarding it completely. Shamans do not seek publicity and often conceal their real names, believing that it protects them from the intrigues of their enemies and evil spirits.Even as they speak with each other, they prefer using pseudonyms. Many shamans do not like being photographed because they are afraid of state officials or excessive public attention.